Piranha 8 removes multiple coats safely and easily in a single application, including most paints, varnishes, polyurethanes and water based latex paints from metal, stone and concrete. 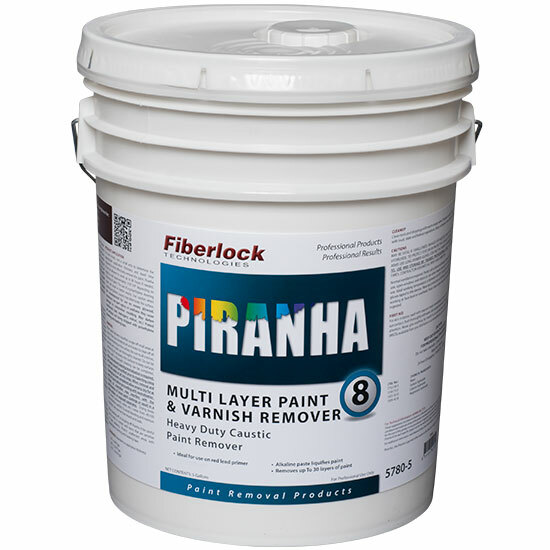 Piranha 8 is particularly well suited for stripping lead paints, including red lead primer from metals. Carefully clean up with a wet mop or HEPA vacuum. Protect all surfaces not being stripped with polyethylene sheeting. Protect plants and vegetation. Apply Piranha 8 with a brush, trowel or specially designed airless spray equipment. Spray: Specialized spray equipment required. Contact Fiberlock Technologies for detailed sprayer application information. (Dependent on application thickness) 1/4” = 6.4 ft2/gal. 1/8” = 12.8 ft2/gal. 1/16” = 25.6 ft2/gal. Key Considerations: Piranha 8 is not well suited to alkali resistant paints such as epoxies, urethanes and cementitious paints. Before general use, it is imperative to test on a small, inconspicuous area to determine compatibility, required dwell time, coverage and desired results. The end user shall determine suitability of the product for its intended use(s), and the user assumes all risk and liability whatsoever. NOTE: Piranha 8 will darken wood surfaces. Do not use on aluminum, magnesium and other soft metals. Piranha 8 is a ready to use product. Do not dilute. Mix before using for best results. Ideal working temperature is between 60-90°F; when applied at surface temperatures below 55°F performance will be reduced and longer dwell times may be required. Higher temperatures can dry out remover prematurely. Avoid direct sunlight. Workers must wear impervious gloves, apron and footwear and safety goggles and/or faceshield while using Piranha 8. Take wind drift into consideration if spraying. Before application, it is imperative to test on a small, inconspicuous area to determine compatibility, required dwell time, coverage and desired results. The end user shall determine suitability of the product for its intended use(s), and the user assumes all risk and liability whatsoever in connection with the application of this product. Note that the dwell time required to remove a paint system is dependent on the application temperature, humidity and the thickness/type of paint system being stripped. Typically 12-14 hour dwell times will yield good results for multilayer painted substrates. However, extended dwell times of 24 to 72 hours can result in more complete outcomes. When Piranha 8 is to be left for an extended period of time (beyond 8 hours), cover with Piranha Paper to slow the evaporation process and extend the product dwell time. Once the paint has fully softened and lifted, remove using a scraper or putty knife. Collect all remover waste and paint residue for proper disposal in accordance with all federal, state and local regulations. Do not store or collect removed paint or residue in metal containers. Use plastic containers only. Once all bulk residues have been removed do not let any remaining residues dry. Immediately following paint removal thoroughly clean substrate with mild detergent solution. If there is a thin layer of paint residue that remains agitation with a nylon bristle brush or pressure washing will often remove this layer. This step is critical when removing red lead primers as the primer will only be fully removed during the final washing and rinsing steps. If allowed to dry the residue will re-harden and the Piranha 8 stripper will need to be reapplied. Perform a final clean water rinse and let surface fully dry for at least 24 hours before proceeding to neutralization. This is a critical step before repainting. If the substrate is not properly neutralized then the new coating system will likely fail. Apply Piranha Neutralizer (Part #5710) according to the directions on the packaging. After neutralizing, test the substrate using pH paper to determine the approximate pH of the substrate. Once the substrate has been sufficiently neutralized (pH of 6-8) allow substrate to fully dry and retest pH. It is important to retest the substrate after it has dried to ensure that no additional residues have “bled” out of the substrate and recontaminated the surface. If the substrate pH test reading is high then repeat the neutralization process until the pH is permanently altered. When washing off or scraping off Piranha 8 be careful not to come in contact with items that are sensitive to high alkalinity. Protect unaffected areas with polyethylene sheeting and masking tape.